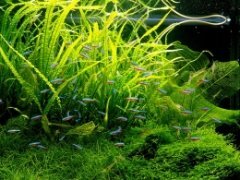 My apologies for running behind on announcing these; you've probably all seen them by now, but in case you haven't, definitely go check out the entries to the 2009 AGA Aquascaping Contest. The best in show tank (above) is just amazing. The dangling branches are a really creative touch, although I'm not sure how the whole tank looks from a normal viewing angle, since there has to be some sort of structure above to hold those in place. The driftwood is placed in such a perfect manner that it looks exactly like roots of a dying/dead tree. Honestly, I think this aquascape would be just as impressive without the branches dipping in, though a little unbalanced. What do you think? Will you be trying this new method? I think the hanging branches are part of the main trunk of the tree. Would like to see one where the tree is angled so that it looks like it has fallen off the bank of a river.